Welcome to yet another post in Io9's reckless lawsuit-baiting series. Find out why water boils, why it's necessary to make sure it does boil, and what happens when it doesn't boil soon enough. To understand what makes water boil, it's important to stop thinking of water as an object, and start thinking of it as a collection of loose particles. A good analogue is an unruly elementary school class. Both the kids and water molecules tend to have a certain cohesion. Still, each particle is separate. If you get a group of kids together, they'll start fidgeting, pushing and shoving, until someone goes flying. In much the same way, in a group of water molecules, individual molecules will move independently, jostling the molecules next to them until some particles are lost into the air as water vapor. Turn up the heat, and this happens faster and faster. Anyone who has wandered through a crowd knows that it's easier to get pushed away from the edge than it is to fight their way out from the middle. This is because the pressure from the people around them keeps them from getting the space they need to push their way out. It's much the same with water. A steadily boiling pot of water indicates that so much energy is being pumped into the pot that pockets of water molecules are jostling each other hard enough to turn into vapor, expand, and push their way to the surface despite the pressure of the water above them. And, in a perfect world, that shouldn't happen. Or at least, it shouldn't happen that easily. Because of the cohesive properties of water, it's hard to create a bubble of water vapor from nothing, even if the water is very hot. A bubble under a certain radius would have more pressure from its own surface tension than from the heated water molecules inside it. Starting a bubble from nothing in one hundred degree water would be like a human trying to properly inflate a car tire by blowing into it. There's just not enough force being applied to expand the thing. Everyone reading this has seen a boiling pot of water, though. What is it that makes it happen? The term that scientists use is ‘nucleation sites.' Nucleation sites break the smooth cohesiveness of the water molecules and allow bubbles to form. The greater the radius of the bubble, the easier it is to overcome the surface tension and expand the bubble even wider, the way it gets easier to blow up a balloon the thinner that the rubber around it is stretched. 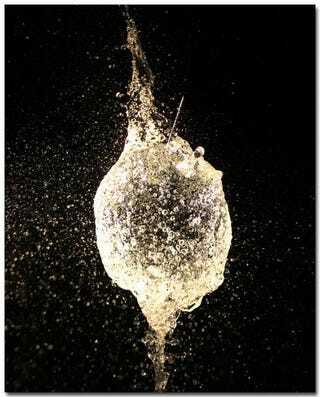 So once a bubble gets started on a nucleation site, it can expand easily. These nucleation sites don't have to be big. Boiling water is easy to get because most containers have irregularities along the sides – translation; people live in filth – and most water has impurities like dust or grit – translation; people also drink filth. That sounds off-putting, but for the most part we are lucky that we live in such a desperately unhygienic world. When there are no nucleation sites, things get dangerous. Nucleation sites allow water to release energy steadily and in a controlled manner. When nucleation doesn't occur, heat and energy are still being pumped into the water. They're just not being released. As a result the water gets hotter than it usually would, and much less stable than it usually is. When something disturbs that stability, and causes nucleation to happen spontaneously, the reaction is extreme. And so it is time for the mandatory Io9 safety lecture. It would be a real shame if someone were to scrub out a clean glass, distill some water so it had no dust in it, and carefully microwave it until it became superheated, only to get a quick glimpse of the explosion before their eyeballs were boiled like green beans. The safest way to see water explode is to view it online. That's also the safest way to share it with friends. Bubbles in boiling water picture by Mike Fisk.